The Memphis Grizzlies are shaking things up. The team announced Thursday that it has decided to fire head coach J.B. Bickerstaff. 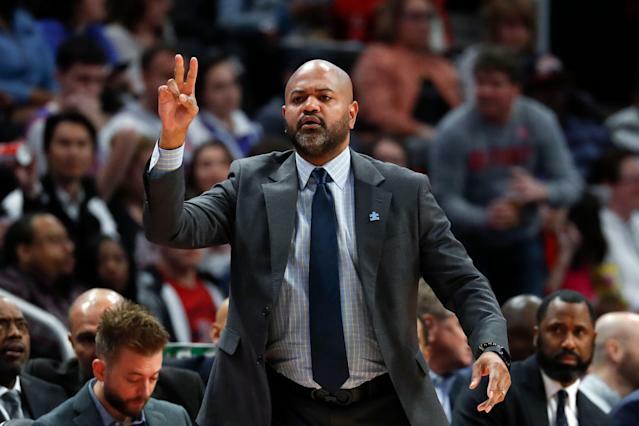 Bickerstaff just finished his first season as the team’s full-time head coach. He served as the interim head coach for the 2017-18 season after David Fizdale’s firing. Over that span, Bickerstaff accumulated a 85-131 record, including a 33-49 mark this season. Sources: J.B. Bickerstaff conducted exit meetings with Grizzlies players today, discussing ways to improve the team and summer expectations — and then went to his own exit meeting with ownership. The organizational changes went beyond just Bickerstaff. Among the changes is a demotion for general manager Chris Wallace, who will “focus exclusively on player scouting” moving forward, the team said. Wallace has been the franchise’s GM since 2007 and oversaw the “Grit and Grind” Grizzlies teams led by Zach Randolph, Mike Conley, Marc Gasol and Rudy Gay. Memphis made the playoffs in seven consecutive seasons, but only once made it to the Western Conference Finals under Wallace’s watch. That came in 2013 and resulted in a sweep at the hands of the San Antonio Spurs, who went on to lose to the Miami Heat in a seven-game NBA Finals. “In order to put our team on the path to sustainable success, it was necessary to change our approach to basketball operations,” team owner Robert Pera said. “I look forward to a reenergized front office and fresh approach to Memphis Grizzlies basketball under new leadership, while retaining the identity and values that have distinguished our team. The Grizzlies’ playoff streak ended last season as the team limped to a 22-60 record with Conley playing in just 12 games due to injury. Bickerstaff took over for Fizdale after just 19 games and was promoted to full-time head coach at the conclusion of the season. This year, the team won 11 more games but now could be headed toward a rebuild. Gasol was shipped to Toronto at the trade deadline, and Conley could possibly be next. Conley was on the block at the deadline, but a deal was not reached. Earlier Thursday, before news of his demotion emerged, Wallace said the franchise would listen to offers for Conley. Moving on from Conley would allow Memphis to build around promising rookie Jaren Jackson Jr., the No. 2 pick who averaged 13.8 points per game before being sidelined with a leg injury. If that’s the direction the franchise takes, it will be spearheaded by a new front office.